Gendun Rinpoche was born in 1918 in a high valley of the province of Nangtschen in Kham, eastern Tibet. His father was a sculptor who carved mantras in wood and stone. In the summer months the family lived in a big tent with their herds. The little boy loved to build a hut out of twigs and play hermit. Already at an early age he had the ability to think deeply and wondered what would be the benefit of worldly actions at the time of death. He thought deeply about the suffering of the beings in the various spheres of existence. He felt deeply sympathetic to their misery and feared that his parents would also suffer a similar fate at the time of their death. His father tried to teach him his craft, but all his efforts were in vain. The boy kept asking for permission to study with a spiritual master. At the age of seven, he received permission to go to the nearby monastery of Khyodrag. The little monk only felt really satisfied when he could stay in meditation. Most of the time he spent at the feet of the great masters of his monastery. At the age of seventeen he received his full ordination and at the age of twenty-one he began the traditional retreat of three years and three months. Afterwards, Gendun Rinpoche practiced for seven years in a strict seclusion in a monastery cell. His master Tulku Tendsin finally visited him and advised him not to remain in seclusion any longer, because he had attained realization in practice and had become a true “holder of blessing”. From now on he can work among men for the good of beings, because his realization is “irrevocable like a golden rock”. After initial hesitation, Gendun Rinpoche finished the formal retreat and embarked on a one-year pilgrimage to holy places throughout Tibet. He then continued his practice for about ten years in secluded caves blessed by great realities of the past. There he attained perfect realization. When Tibet was occupied by military forces in 1959, Gendun Rinpoche appeared to be a protective deity who advised him to leave for India. When he arrived, the 16th Karmapa Rangjung Rigpe Dorje entrusted him with the management of a new monastery in Bhutan for three years. After that, Gendun Rinpoche lived in Kalimpong (North India) for a further twelve years, during which he received transmissions of the 16th Gyalwa Karmapa each year. In 1975 he came to France at his request. 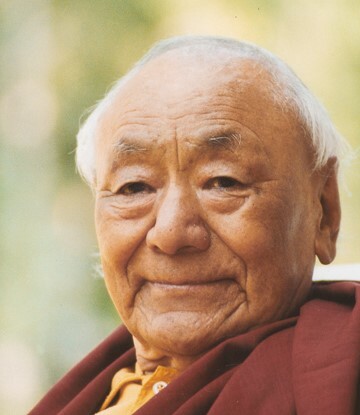 Gendun Rinpoche devoted himself tirelessly to the spreading of the Dharma. In the years up to 1990 he traveled several times through almost all the countries of Western Europe. In 1983 he founded a retreat centre in Auvergne (France) where people from many countries of the western world practice for three years or more. This was followed by the creation of the monastic communities in Le Bost and Laussedat and a temple for meditation courses and ceremonies (also Le Bost). On Friday, 31 October 1997, Gendun Rinpoche left his body in the presence of some close students in Dhagpo Kundrol Ling. Only nine days earlier, on October 22nd, Rinpoche had personally blessed more than a thousand people during the closing ceremonies of the retreat. The burning ceremonies were conducted 49 days later by Shamar Rinpoche and also took place in Dhagpo Kundrol Ling. Gendun Rinpoche’s special feature was the simplicity of his presence, so open and so close. He has never wanted to give the impression of being a great lama, someone special, but rather seemed more like an ordinary lama, and that is exactly what is extraordinary about him. Everyone could approach him without difficulty. In 1999 Heaven Six was recognized by the 14th Shamar Rinpoche as the rebirth of Gendun Rinpoche. Heaven lives in France. He regularly visits the Dharma Center Möhra and receives a part of his training here.